Vitamin-R breaks down large, vaguely defined tasks into a series of short "time slices" of between 10 and 30 minutes, each with specific, easily reachable and actionable objectives. During these time slices it keeps you focused on accomplishing only this one objective and provides you with mechanisms for dealing with interruptions, poor concentration, etc. Vitamin-R concentrates on getting you started allowing you to break through the resistance of procrastination and create a positive feedback loop of small achievements that get you closer to your ultimate aims. You will experience less stress caused by looming deadlines and a lack of clear direction, thus enabling you to enjoy guilt-free breaks that allow your intuition and creativity to emerge. 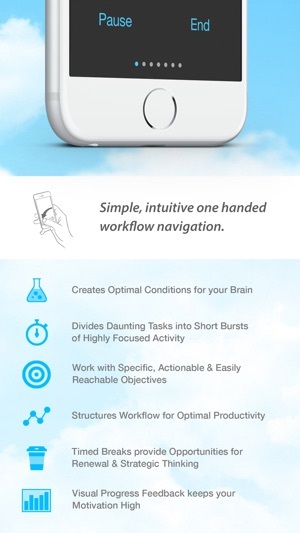 Vitamin-R features an array of highly configurable visual, audio and speech notifications that get you back to your task as soon as your attention starts wandering. Task switching is a big, but often unavoidable productivity killer. So when you need to switch tasks Vitamin-R will make it as efficient as possible and help you pick up where you left off later on. Regular breaks are not for slackers. In fact, taking regular breaks is especially important for people who work with high focus. Vitamin-R's timed breaks make sure that your renewal break does not turn into a free afternoon and the "priming" technique allows your intuition to work overtime before you even start on a time slice. Each one of us is different. Finding out what works best for you is the key to true productivity. Vitamin-R gives you the tools to gain awareness of where you spend your time and what works for you. Armed with this new knowledge, you can eliminate unproductive work patterns and discover the work rhythm that suits you best. 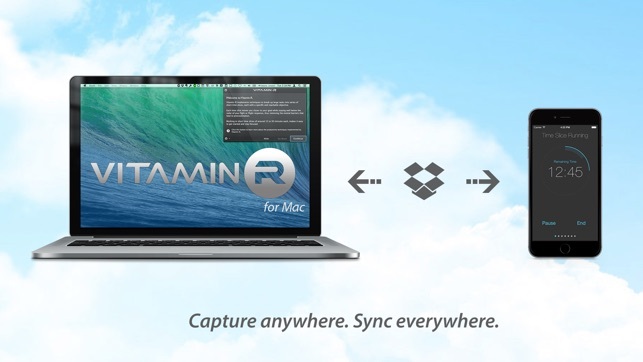 Vitamin-R for Mac has been the most comprehensive Time Boxing solution on the Mac for years and you can now seamlessly sync you time slices across devices. Vitamin-R was never specifically designed with ADHD "suffers" in mind, but many ADHD-ers have found Vitamin-R's approach to focusing attention particularly valuable. Many students, especially at Medical School (who will also get the joke), use Vitamin-R to help them achieve their full potential. I really like this app. 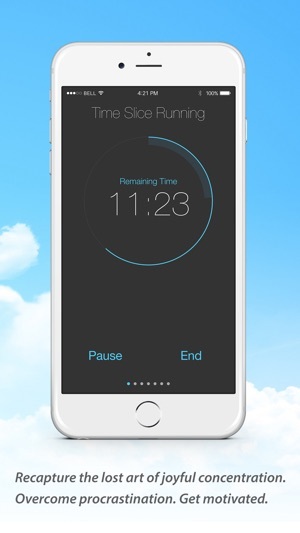 I use it as a timer, a way to log my tasks, and record my productivity flow. I noticed that I have used it more than any other productivity tracker that I have (which is quite a few). 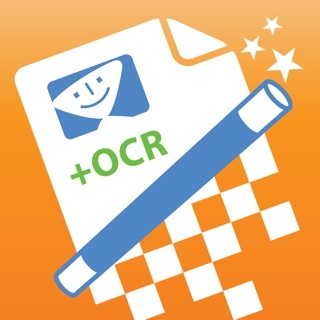 It is simple and easy to use, which is great since I don’t have to waste time setting up tasks just to track them. I like the features of being able to view my productivity flow over the course of time, including daily and weekly. I have noticed a trend in the hours I am most productive during the day as well as the times where I struggle with distraction and focus. The logging feature and viewing the log is simple, although I think it would be nice to see if there is a way to organize my tasks. I would also consider a feature to save certain tasks under a project to see how much time is spent working and completing them. Another suggestion I would like to provide is an option to manually log a task that I have forgotten to record. Sometimes I dive head first into my work that I forget to set up the tracker. Is there an export feature? If not, that would be great too. There are a few bugs, especially with the rotation feature. 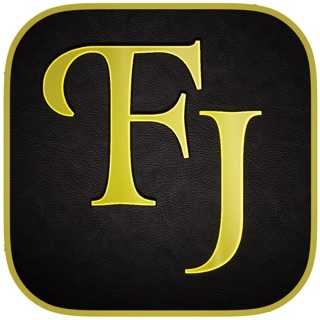 Overall I find this app to be extremely useful. 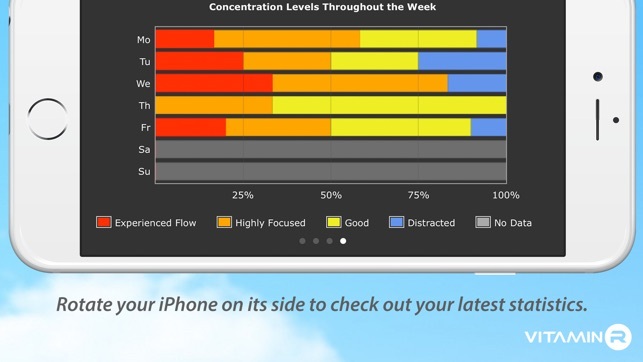 It is a bit pricey, but I would recommend this app, especially to those like myself that struggle with trying to identify concentration and productivity levels during the day and week. 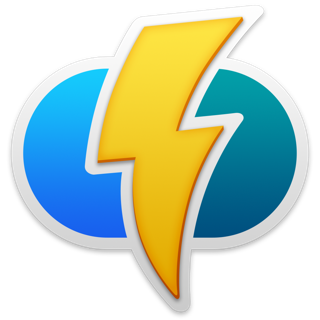 Vitamin-R for macOS is a much more full-featured application and the iOS version is mostly for users of the Mac version who want to log their time slices on the go as well. The Mac version offers reports based on tags so you can see how time you spent on different projects (if you use project = tag) and many more of the your suggestions here. 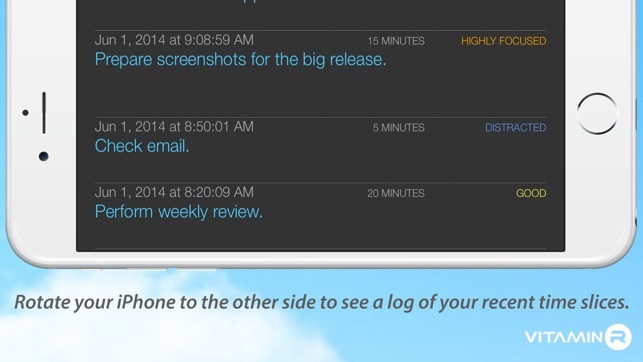 Eventually those features will make their way over to the iOS version. Bug: As a user, when I rotate my phone clockwise and click on a past objective, then set it as my current objective, the request does not change my current objective. Suggestion #1: In the objective name field I use the following taxonomy: Company, Activity and Project. For example, jiveSYSTEMS - Content – DSLR vs. iPhone vs. Webcam Post. I’d like to be able to see Total TIME by Company, Activity and Project. Suggestion #2: As a user, when I rotate my phone clockwise, I’d like to be able to click on an objective and edit the objective name. I do most work on my iPad pro with an attached keyboard. That makes this app completely useless for me. I can't keep pulling the keyboard off and turning the iPad up to portrait mode to set up the next time box. They should put this deficiency in the up front description of the app. I should have read the critical reviews before I spent my money. Would like my money back.